When an air system requires large quantities of air (ca. >100 m3/min) and air demand highly fluctuates during the day, it is common belief among end-users that large variable speed screw compressors can deliver significant savings opportunities by precisely matching the compressed airflow to the system’s demand. Consider the case depicted in Fig. 1 as an example. Where the daily flow demand has a variability of up to 90% of the maximum air demand, the study compares the energy consumption of six alternative solutions in terms of number of installed compressors, compressor sizes and types of compression technologies (i.e., oil free centrifugal and oil free rotary). Fig. 1: High variability (90 percent) flow profile for a 24-hour time period. The influence of an air compressor’s control system and its different control logics is also taken into consideration in the analysis. The energy consumption of the same six solutions are then compared with different air demand patterns to simulate the behavior of the six systems in the case of varying production needs (i.e., other four daily air demand patterns with different variability are also considered). There are different compression technologies and each one can have its own advantages and disadvantages, depending on the particular application, operating range, power, capacity and other aspects. Nevertheless, when an air system requires large quantities of air and air demand highly fluctuates during the day, it is a common belief among end-users that only the use of large, variable speed screw compressors can deliver great saving opportunities by exactly matching the flow of the compressed air delivered to a system’s demand. The purpose of this study is to compare and evaluate six different compressed air solutions when air demand is highly fluctuating. The study considered five variable flow profiles, as depicted in Fig. 1 to 5, to define some guidelines to help end-users select the best system for their application. In Case No. 1 (Fig. 1-2), the air demand highly fluctuates between night and day shifts, from approximately 30 m3/min to 220 m3/min, which represents a variability of 90 percent of the flow. Fig. 2 further defines the flow profile in Case No. 1. The y-axis represents the request flow as an absolute figure on the left, and as a percentage of the maximum requested system flow on the right. The x-axis shows the time as a percentage of the total observation period. Given this data, the researcher can deduct that the plant represented in Case No. 1 operates below the average flow almost 50% of the time. This flow spectrum is typical of a production site with two six-hour night shifts with low air demand and two six-hour day shifts with high air demand. Case No. 2 (Fig. 3): Another highly variable spectrum with 90% of variability but compared to Case No. 1, less than the average flow is requested for only 30 percent of the time. This spectrum is typical of a production with one eight-hour night shift with low air demand and two eight-hour day shifts with high air demand. Case No. 3 (Fig. 4): Similar to Cases No. 1 and No. 2 but with lower variability than before (ca. 65 percent of maximum flow instead of 90 percent). To differentiate it from the previous two cases, we call this a case with medium variability. As for Case No. 1, this variability occurs for a long time, as less than the average flow is requested for approximately 50 percent of the time. Case No. 4 (Fig. 5): A medium variability flow pattern (ca. 65 percent of maximum flow, like Case No. 3); compared to Case No. 3, less than the average flow is requested only 30 percent of the time. Case No. 5 (Fig. 6): A low variability flow pattern with a variability of only approximately 30 percent of the maximum flow all day long, representative of 24 hours per day — almost constant production. Solution A considers one centrifugal compressor and one large (700 kW) variable speed screw compressor whose maximum flow is half of the system’s maximum flow demand. Solution B uses two centrifugal compressors whose maximum flow is half of the maximum system’s flow demand. It is known that centrifugal compressors can be designed for best efficiency with a smaller regulation range or a wide regulation range, also called turndown, with lower design efficiency. In this second solution, compressors are designed for peak efficiency and have the latest and most efficient load-sharing control. Solution C utilizes two centrifugal compressors designed with wide regulation range. Also in this solution, like for all the following solutions with multiple centrifugal compressors, the centrifugal compressors have a load-sharing control since this control system always allows reduction in the blow-off of the centrifugal compressors by extending the system’s regulation range. Solution D considers three centrifugal compressors whose maximum flow is one-third of the system’s maximum flow demand. It is designed for wide turndown and load-sharing control. Solution E considers mixed technologies, but in this case there are two centrifugal compressors with load-sharing control and one small (160 kW) variable speed screw compressor. In this scenario, the compressors are not controlled by a scheduler. This means that the small variable speed screw compressor is used only to cover peak air demands. Solution F utilizes the same compressors as in E, but in this case the three compressors are controlled by a scheduler. The scheduler allows the system to operate — for example, to load, unload or switch-off — each compressor according to a predefined schedule in order to optimize the system from various points of view; in this case, from the energy consumption point of view. Coming back to our original flow profile in Fig. 1, Solution A — with one centrifugal compressor and one large variable speed rotary compressor — can exactly match the flow requested by the system. For this reason, it is an unbeatable combination as there is no wasted air. Nevertheless, what we have to establish is whether it is also the most efficient solution from an energy consumption point of view. The use of one single centrifugal compressor with a maximum flow equal to the maximum system demand is not a viable solution due to the large amount of wasted air, as shown in Fig. 4. For this reason, this configuration was not listed among the previously discussed solutions. When multiple centrifugal compressors are installed in a system, it is possible to reduce the blow-off of the centrifugal compressors with the installation of a load-sharing control system. Figs. 8 and 9 show the difference, in terms of regulation range of two identical compressors, whose maximum flow is half of the system’s maximum air demand, without and with a load-sharing control system. In the case of variable flow demand beyond the natural regulation range — also called “turn-down” — of a centrifugal compressor, the use of a state-of-the-art load-sharing control system is always beneficial when two or more centrifugal compressors are used in a system, since air blow-off is reduced. Each of the solutions described in Solutions B to F allows the system to have a different amount of wasted air. In some cases, like Solution F (Fig. 7), the air blow-off is minimal. It is very close to the zero blow-off in Solution A, using one centrifugal com¬pressor and one large variable speed screw compressor. Nevertheless, it is not the minimization of the air blow-off that determines the best systems but the minimization of energy consumption. 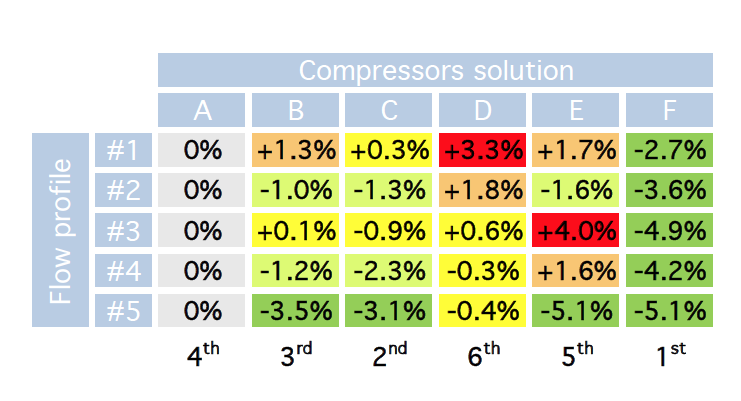 Considering the performances at a pressure of 8 barg for each of the compressors used in Solutions A to F, Fig. 8 shows the comparison of the daily energy consumption for the flow pattern of Case No. 1 with high variability for a long time. It also shows the relative efficiency between Solution A — the unbeatable solution — and the other five solutions. The efficiency of Solution A is taken as a reference and equals 100. Solution A is not the unbeatable solution, but Solution F — composed of two centrifugal compressors with load- sharing and one small 160 kW variable speed screw compressor with a scheduler — is the best solution in terms of energy conservation. Solution F allows the user to save almost 3% compared to Solution A. Solution C — configured with two centrifugal compressors designed with wide regulation range and load-sharing control — despite some air blow-off, is only 0.3 percent lower efficiency than Solution A; therefore, it is a preferable option from an operating point of view. In fact, if we consider 300 operating days per year and an average energy cost of 0.10 €/kWh ($0.13/kWh), Solution A allows operators to save only 1500 € ($19,500) per year versus Solution C. These savings do not justify this system’s operating disadvantages: Solution A utilizes two compressors with completely different spare parts, and if a backup compressor is needed, only one can be chosen, which does not guarantee the same operating efficiency. Solution C, using two identical centrifugal compressors, eliminates both of these problems. Fig. 9 shows the annual pure energy costs comparison¹ of the six compressor solutions in case of an airflow pattern, as per Case No. 1. Another important consideration is to evaluate the behavior of the six solutions in case future production changes affect daily air consumption. Fig. 9: Yearly energy costs comparison in Case No. 1. The flow patterns in Cases No. 2 to 5 represent different variable airflow profiles under various production conditions, which cover almost all the solutions — from the most variable to the least variable — as depicted in Figs. 3 to 6. Table 1 summarizes the relative efficiencies between Solution A and the other five solutions with variable flow profiles, as in Cases No. 1 to 5. Table 1: Energy efficiency comparison: The efficiency of Solution A is used as a reference. Negative red or orange percentages indicate that the system is less efficient than Solution A, and positive and green figures indicate that the system is more efficient than Solution A. Yellow means the two systems are more or less equal. The last row shows the ranking of the six solutions considering the system’s efficiency (or yearly energy costs), flexibility and ease of operation, i.e., common spare parts and an equally efficient backup compressor. Consider again compressor performances at a pressure of 8 barg, 300 operating days per year, and an average energy cost of 0.10 €/kWh ($0.13/kWh). Solution F allows operators to save 15000 € ($19,500) per year in Case No. 1 and approximately 40000 € ($52,000) per year in Case No. 5, compared to Solution A. Solution C has slightly higher energy costs, about 1500 € ($1,950) per year in Case No. 1, but in Case No. 5 it allows approximately 25000 € ($32,500) per year in savings compared to Solution A. Evaluating Case No. 1, a person may wonder how Solution A — which is able to deliver exactly the airflow requested by the system without any air blow-off — has almost the same efficiency as Solution C. The answer is revealed in Figs. 13 and 14. Fig. 10 compares the specific power at 8 barg of different centrifugal models with large variable speed screw compressors². A 75 m3/min centrifugal compressor working at the design point is 19% more efficient than a 500 kW variable speed screw compressor; a 115 m3/min centrifugal compressor is 14% more efficient than a 700 kW variable speed screw compressor; and a 140 m3/min centrifugal compressor is 19% more efficient than a 900 kW variable speed screw compressor. The energy saved against the variable speed screw compressor when the centrifugal compressor works near its design point, or in general in its full regulation range, compensates for the energy that is wasted from centrifugal compressor blow-off. In fact, if we plot the specific package power of the 115 m3/min centrifugal compressor used in Solution C, both in its regulation range and also when blowing-off (Fig. 11), we see that the specific power remains better for a range even wider than just the regulation range. In summary, only the knowledge of the real weight or balance, in terms of percentage of time or variable operating conditions, allows operators to determine if the large variable speed screw air compressor is right for the system. This is an important concept that is often neglected or misunderstood. We will use another real case to clarify this concept. There was a customer with five old 4 barg centrifugal compressors of various sizes ranging from 70 m3/min to 120 m3/min. Last year, he decided to update the compressor room to reduce operating costs. He said an audit was performed and the first step was to improve their system’s efficiency. To accomplish this, he decided to replace one centrifugal compressor with a 500 kW variable speed screw air compressor. After further investigation, they determined that some mornings between 8-10 a.m., the manufacturer had to shut down one production line to prepare for the type of glass to be produced the following day. During these two hours, they had an excess of air of 60 m3/min. Since the old centrifugal compressor was able to regulate only 20 m3/min, the centrifugal compressor was blowing off 40 m3/min of air. By replacing this compressor with a 500 kW variable speed screw compressor, he said they would have been able to avoid any blow off, improving the system’s efficiency and reducing the operating costs. Unfortunately, this was an incorrect and misleading approach. It is true that a 500 kW variable speed screw compressor would avoid blow-off during the plant’s downtime, but the customer did not consider a real performance comparison as shown in Fig. 12. The customer should have conducted an energy cost comparison between a new, two-stage centrifugal compressor and the desired two-stage 500 kW variable speed screw compressor. It can be deducted from the compressor’s data sheets that at an operating pressure of 4 barg, a 500 kW variable speed screw compressor is 43% less efficient than an equivalent centrifugal compressor. Even if the centrifugal compressor is blowing off 13 m3/min, it is more efficient than the variable speed screw compressor. To determine the best machine for the application, the customer should have evaluated the cost of blowing-off 40 m3/min for two hours per day and calculated the extra cost of using a compressor that is 43% less efficient the remaining 22 hours of the day. To avoid wasting 12.000 € ($15,600)/year due to the blow-off during scheduled down time, the customer would have spent 110.000 € ($144,000)/year more, running a 43% less efficient compressor for the rest of the day. Even if we consider that 22 hours/day the variable speed screw compressor does not always work at full load, the difference is so large that it would be hard to affirm that the customer would have saved energy and money by buying a 500 kW variable speed screw compressor instead of a new centrifugal compressor. The cases analyzed in this article show that when an air system requires large quantities of air (ca. >100 m3/min) and air demand highly fluctuates during the day, the use of large variable speed screw compressors (300-400 kW and above) rarely represents the magic solution that is often claimed by some compressor manufacturers. Alternative technologies or solutions, like the centrifugal compressor with load-sharing control, often allow operators to realize much greater energy savings, despite the system air blow off. In fact, centrifugal compressors can be more efficient than large, variable speed screw compressors even if they blow off 10-15% of their design capacity. Rather than evaluating if one compressor technology reduces compressed air blow off, it is recommended that operators evaluate the compressor’s efficiency over its operating range, i.e., at full load and partial loads. First, it is important to know the system’s exact flow profile and flow spectrum to determine how much time the compressor will operate in one condition versus another, e.g., blowing-off some air vs. operating near its design capacity. For this reason, it is important to conduct an air assessment before starting any evaluation. The results must be read and interpreted correctly — and not exploited to justify the sale of a compressor! 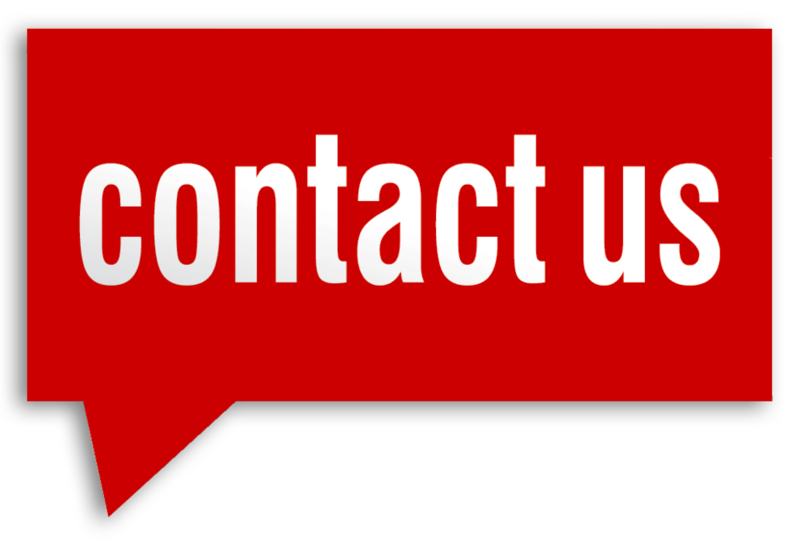 Nevertheless, each case is customer-specific and several aspects that could influence the final choice should be considered: installation requirements, floor space, need for backup units and/or spare parts stock, system’s flexibility in case of different future production needs and initial capital investment. The initial capital investment was intentionally excluded from this study because the scope was to evaluate the systems from the energy consumption point of view only. The initial capital investment and payback period would drive the final decision. Without entering into pricing discussions or details, Solutions B and C are likely to have the lowest initial capital investments.